Earthquake hits Wyoming; landslide reported Montana ballot initiative I-161 seeks to abolish 5,500 outfitter-sponsored big-game licenses. It never fails. Every time I find myself driving across the immense open space and undulating landscape of the front range in Montana, I puzzle myself over the absence of bison. And each time I hear about the threat posed to livestock by wolves, I wonder how different it would be if bison were out there. Just today, I was speaking to Chief Jimmy St. Goddard of the Blackfeet Nation about restoring balance to nature (versus plopping species down onto landscapes), and he stated “wolves will go where the bison are.” Humans, being lazy by nature, tend to think that given the choice between cows and bison, wolves would favor the slow, dumb ones. But we’ve never given them that choice. Since wolves co-evolved with bison, I tend to think Chief Jimmy knows what he is talking about. Last year, WWP’s Montana office premiered “Lords of Nature” in Montana, a film documenting the importance of top predators like wolves to healthy ecosystems. Scientists were surprised to learn after reintroducing wolves into Yellowstone that there was a dramatic improvement in riparian ecosystems, benefitting fish and birds and creating a cascading beneficial effect on the food chain. 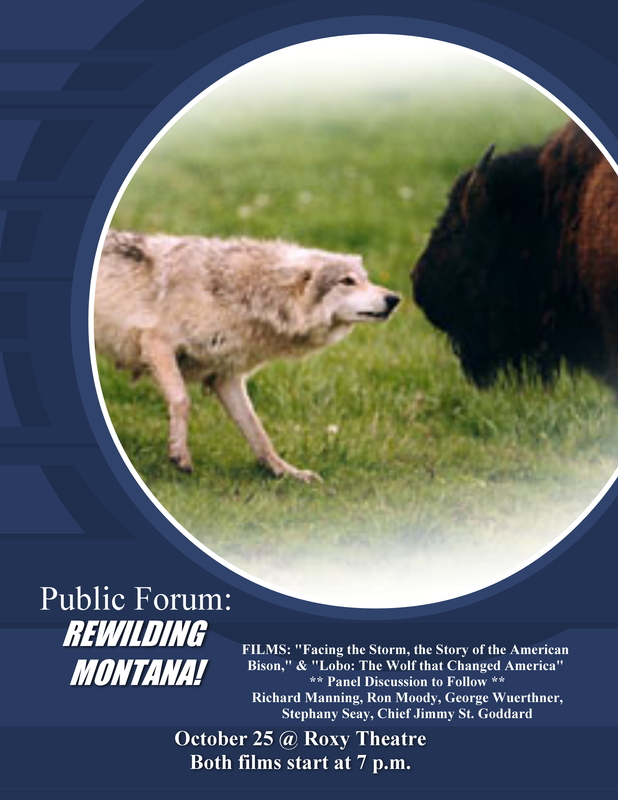 Then we had a lively panel discussion that included Montana Wolf Coordinator Carolyn Syme. In arguing for management authority in federal court, Montana emphasized how “all species fit together”, with the wolf being an “integral part” of the ecosystem. But when asked why bison should not then be welcomed back to Montana, Syme refused to answer, pretending the question was a matter of opinion, not science. This year, we are presenting two films with a panel discussion. We’re excited to show the new High Plains Films documentary on bison, “Facing the Storm.” According to the filmmakers, the film shows that “the American bison is not just an icon of a lost world, but may very well show us the path to the future.” In a second theatre, we will be showing a film that premiered at the Wildlife Film Festival last year, “The Wolf that Changed America.” It’s a remarkable story about a wolf bounty hunter named Ernest Seton who was hired in 1893 to kill America’s last wolf, a notoriously crafty and elusive wolf named Lobo, and was so changed by the ordeal that he became a global advocate for wolves and helped spearhead America’s wilderness movement. Afterward, there will be a panel discussion with George Wuerthner, author of “Welfare Ranching”, Richard Manning, author of “Rewilding the West”, FWP Commissioner Ron Moody, and Chief Jimmy. Buffalo Field Campaign Spokesperson Stephany Seay will moderate the discussion. According to recent scientific studies by independent experts, wild bison present almost no risk whatsoever of transmitting brucellosis to livestock. So the kind of balanced wildlife management approach we intend to discuss in this public forum is socially feasible, scientifically justified, morally compelling, and economically smart. Please join the dialogue. Tom Woodbury, Montana Director, Western Watersheds Project. “Facing the Storm: Story of the American Bison” – the new documentary from High Plains Films that will be premiering nationally on PBS at a later date. “Lobo: The Wolf That Changed America” – A “Nature” film that premiered at the Wildlife Film Fest, documents the story of Ernest Thompson Seton’s transformation at the hands of Lobo, the wolf he was hired to track and kill in New Mexico in 1893. WHEN: 7 PM, Monday, October 25, 2010. WHERE: Roxy Theatre, downtown Missoula. Chief James St. Goddard (Ee-Suk-Yah), hereditary Chief of Blackfeet Nation, former member of Blackfeet Tribal Business Council. The wolf management issue de jour tends to be viewed in isolation from its ecology. There are some who believe restoring bison to Montana’s landscape is not only the right thing to do, but will also go a long way toward resolving conflicts between wolves and livestock and elk, since bison and wolves co-evolved, and bison were one of the wolves primary protein sources. The focus of this forum is to conjoin these issues, and to begin discussion what a natural wildlife heritage would look like in Montana. The Native American perspective is consistently ignored by the media and governing bodies in regard to these two species, which happen to be central to Native American cultural practices and beliefs. We are honored to have Chief St. Goddard on our panel, as he is an eloquent spokesman not just for Native Americans, but for his brothers bison and wolves as well. This sounds like a great event. I wish I lived close enough to attend. Maska……It was. I’ll send you a DVD of the panel discussion soon as it’s available.